The 200B includes all of the features of the 200A, and a few more. Enhancements include three recording configurations in a single headstage (one patch and two whole cell ranges, with capacitance compensation ranges of 100 pF and 1000 pF), increased voltage and current command ranges (to ±1V) for electrochemical measurements, built-in capacitance dithering capability for capacitance measurements, and addition of series resistance compensation to the current clamp circuitry to improve performance. Seal Test now provides current steps in current clamp mode as well as voltage steps in voltage clamp mode. Leak Subtraction is now more sensitive in the most important resistance range. The recording bandwidth has been doubled to up to 100 kHz. Command and bandwidth ranges are larger. Series Resistance compensation is now active in current clamp as well as in voltage clamp mode to enable bridge balance to be used. The Axopatch 200B is the latest version of the premier Axon Instruments patch-clamp amplifier incorporating the innovative Capacitor-Feedback technology for single-channel recording, and resistive-feedback for whole-cell recording, providing the best possible performance for single-channel and whole-cell patch clamping. Convenient features include ZAP (to rupture patches when going whole cell), dual-speed current clamp (to allow faster current clamping in small cells), Holding Command to set voltage commands in voltage clamp and current commands in current clamp, and a choice of three gain settings on the dedicated current output (for patch, whole-cell and loose-patch modes). The Axopatch 200B provides the lowest-noise single channel recording available. The amazingly low open-circuit noise of 0.13 pA rms (10 kHz) increases to only 0.145 pA rms when a patch-pipette holder is attached to the headstage input and the pipette capacitance is fully compensated (to eliminate capacitance charging transients). The power of capacitor-feedback technology is shown below (Figure 1): capacitor feedback at room-temperature is clearly superior to resistive feedback technology; cooled capacitor-feedback is even better! An unprecedented achievement in the field of ultra-low noise recordings! Shown above: Noise spectra from patch-clamp amplifiers showing the noise contribution of the amplifier. Top trace, a resistive headstage; Middle trace, Axopatch 200B at room temperature; Bottom trace, Axopatch 200B with circuitry cooled to -20° C. Even at room temperature, the noise performance of the capacitor-feedback amplifier is clearly better than the resistor-feedback amplifier. Cooling dramatically reduces the noise even further, for the lowest noise ever. Included: Efficient controls for whole-cell capacitance compensation, a unique “super-charging” form of series-resistance compensation that complements the conventional “correction” form, and a variable LAG control; output gain with 1000-fold dynamic range; 4-pole Bessel filter; onboard leak subtraction; dual external-command inputs; versatile panel meter displaying Holding Command, rms current noise, membrane potential, tracking potential and current at the headstage input; telegraphic output of values for output gain, filter frequency, headstage mode (gain) and measured cell capacitance; ZAP; and dual-speed current clamp. Also, with the Axopatch 200B the bath is grounded for convenience of use and straightforward addition of command and compensation potentials. With unprecedented low noise and superb linearity, the Axopatch 200B capacitor-feedback integrating headstage is ideal for measuring sub-picoamp current signals. Through the use of this technology the electronic circuit noise has been reduced to such a level that the noise inherent in the components themselves has become significant. In the Axopatch 200B, we have introduced active cooling of the critical circuit components in order to reduce the thermal noise and so lowered the noise contribution of the amplifier itself to the lowest levels possible. The Axopatch 200B is the ultimate low-noise amplifier. Headstages useful in artificial bilayer experiments must be stable with large input-capacitance loads. The Axopatch 200B is rock solid with an input capacitance of 1000 pF. Furthermore, the integrating technology in the Axopatch 200B enables the bilayer voltage to be stepped very quickly. There are two reasons for this. First, the integrator has an inherently large dynamic range that allows it to transiently pass currents of several microamperes. Second, during large command voltage steps the integrator enters the reset state. In this state, the headstage continues to operate as a voltage-clamp amplifier but with a very low feedback resistance. For the few ms that the integrator is in the reset state it can pass up to 1 mA to rapidly charge the bilayer capacitance. In whole-cell recording more current noise is produced by the cell and the environment than by the patch clamp amplifier. Hence, the benefits of a low-noise capacitor-feedback headstage cannot be effectively utilized in whole-cell mode. For this reason, the Axopatch 200B uses traditional resistor feedback headstage electronics for the whole-cell mode of patch clamp recording. The CV 203BU headstage includes two feedback resistors to provide a wide range of current-passing capacity in the whole-cell mode. The 500 megohm feedback resistor (ß=1) provides both low noise and a large current passing ability (20 nA). For larger currents, one can switch to the 50 megohm feedback-resistor (ß=0.1) to pass up to 200 nA. There are two goals of series resistance compensation, Prediction and Correction. By transiently increasing the size of the command voltage step (“supercharging”), membrane potential is made to achieve its assigned value as rapidly as possible. To eliminate error due to the voltage drop across the electrode and to improve the bandwidth of the recording, positive feedback is applied to increase the command potential by adding a signal proportional to the measured current to the command input of the headstage. Series Resistance Prediction and Correction may be used together or separately on the Axopatch 200B. The Axopatch 200B employs a dual-speed current clamp to optimize speed and stability. The choice of speeds depends on pipette resistance. For pipette resistances above 10 megohm, the I-Clamp FAST mode can be employed to obtain a rise time of 10 µs under many experimental conditions. The I-Clamp NORMAL mode guarantees stability for any pipette resistance above 1 megohm. In addition, current clamp to zero current (I=0 mode) is available, as is a slower clamp to zero current (Track mode) useful for following slow changes in pipette offset while approaching a cell before seal formation. In addition, the Axopatch 200B includes series resistance compensation in current clamp that allows for correction of voltage errors due to the pipette resistance. 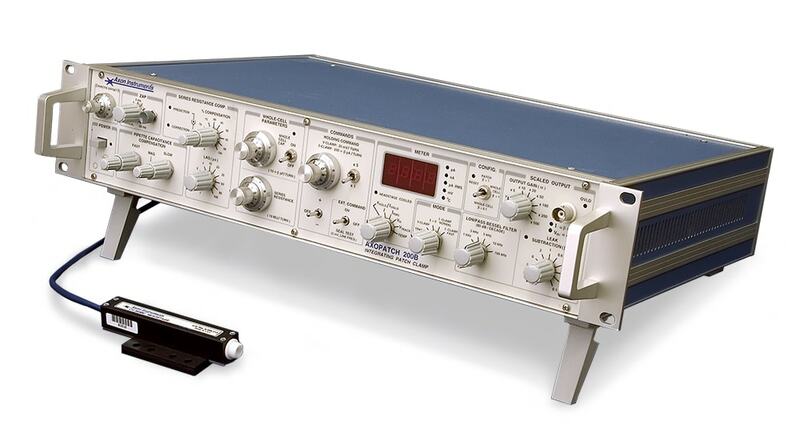 The Axopatch 200B offers the lowest-noise patch-clamp amplifier technology. The open circuit (amplifier) noise in patch-mode has been reduced to unprecedentedly low levels: < 15 femtoAmps (rms) below 1 kHz bandwidth, < 60 femtoAmps (rms) below 5 kHz bandwidth, and < 130 femtoAmps (rms) below 10 kHz bandwidth, all measured with an 8-pole Bessel filter. Noise is still low (145 femtoAmps rms below 10 kHz bandwidth) with a pipette holder attached. This translates into lower noise during actual recordings; this noise performance is achieved in part by cooling the input field-effect transistors inside the headstage to well below 0° C.
Better noise performance is only part of the story. The redesigned, slim headstage improves electrode access to the preparation by making it easier to fit under your microscope. We now include BOTH whole-cell ranges (previously available only in two separate headstages) in one headstage. The Axopatch 200B provides ±250 mV of offset potential. The convenient seal test may be used in voltage clamp mode (5 mV pulse) or in current clamp mode (50 pA (ß=1) or 500 pA (ß=0.1). Two separate command potential inputs allow you to sum command input signals from two different sources. The back panel command is scaled to afford greater range (up to ±1V), and so is quite useful for electrochemical measurements. The Holding Command of the Axopatch 200B has been enhanced over that of its predecessors with the addition of a X1 and X5 switch that allows you to choose either 0 – 200 mV or 0 -1 V ranges. An ON/OFF switch can disable this control when an external command from a computer is used to establish the holding potential. In operation in both voltage- or current-clamp modes, controls the Magnitude and tau of two time constants, Fast and Slow. Compensate up to 100 pF (ß=1) or 1000 pF (ß=0.1) to allow recording from a large range of cell sizes. Ten gain settings spanning a 1000-fold range may be selected to scale the output to the most desirable level. The Axopatch 200B allows you to correct leak errors as they appear without adjusting your data-acquisition software settings. A 4-pole Bessel filter with five settings from 1 kHz up to 100kHz allows you to set the bandpass appropriate to your application over a range double that previously available. Reports values for current, voltage or headstage temperature while in any operational mode. Steady-state current is reported to monitor voltage-clamp output. To evaluate noise, current is displayed as an RMS value. The Axopatch 200B facilitates patch rupturing by applying a single +1.3V pulse for a chosen duration. Two HL-U holders are provided, of different barrel lengths, that accept pipettes of 1.0 mm to 1.7 mm OD. A useful guide to the operation of the Axopatch 200B written by scientific consultants, with the assistance of Axon Instruments staff.